Spanish Thyme or Cuban Oregano is an unusual, fleshy leafed plant used as a culinary seasoning in the Caribbean. The brittle stems and colorful foliage resemble the common Coleus. Growth is slow in the winter months and moderate in spring and summer. Heat and direct sun don't seem to adversely affect growth or appearance. Insignificant flower stems form in the fall. It is extremely tender so grow in a protected area or keep it mobile in a container so it can be placed in a controlled environment in the winter. Indian Borage. The leaves emit a very strong aroma when handled. A succulent perennial herb that can reach 50 cm in height with fleshy leaves in opposite pairs. It occasionally produces pale violet flowers. A plant cultivated and running wild in Malaysia. It is probably a native of India. 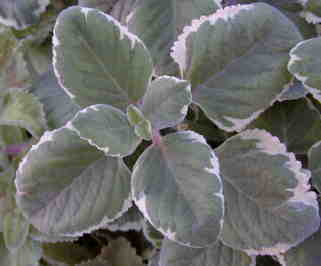 Uses Leaves are mainly used in stuffing and for flavoring meat, also as a substitute for sage. Its strong smelling aromatic leaves are used medicinally by Indians as a cure for coughs. This information is from the The Singapore Science Center. This plant is sometimes available in plug trays. These trays hold 128 of all the same plant. They are a great low cost way to fill a lot of space. Each cell is 3/4 of inch by an inch. Check here to see if Variegated Spanish Thyme Plug Trays are available.